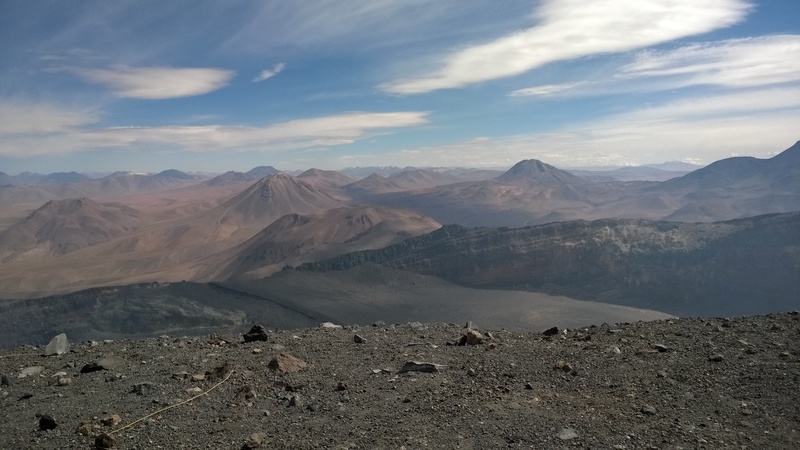 Climbing Lascar – The Most Active Volcano in Northern Chile | Rambling Outback. Lascar is in the center. Click image to enlarge. 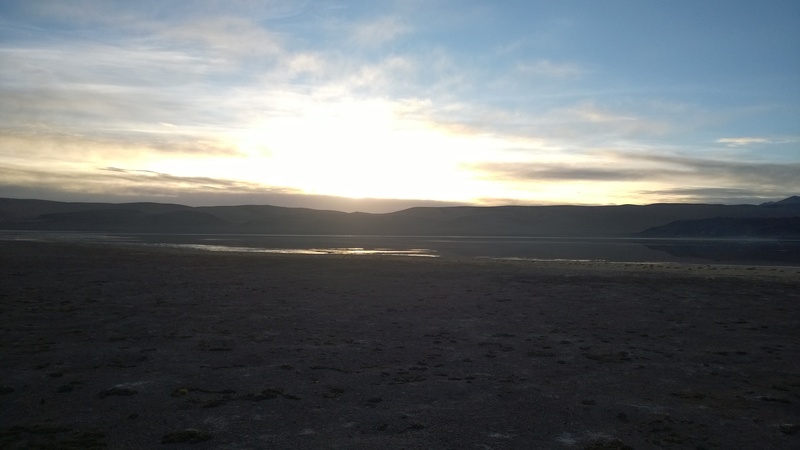 This is from the Salar de Atacama salt flats. 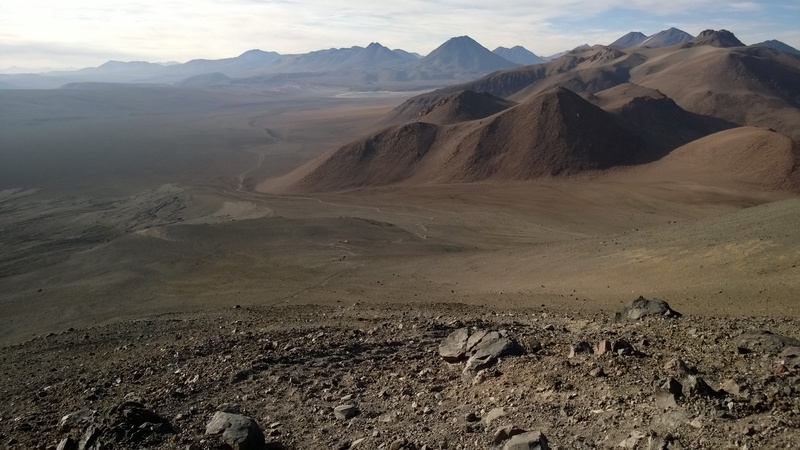 If you ever find yourself in the San Pedro de Atacama area of Chile, Lascar will prove to be an easy volcano to spot. 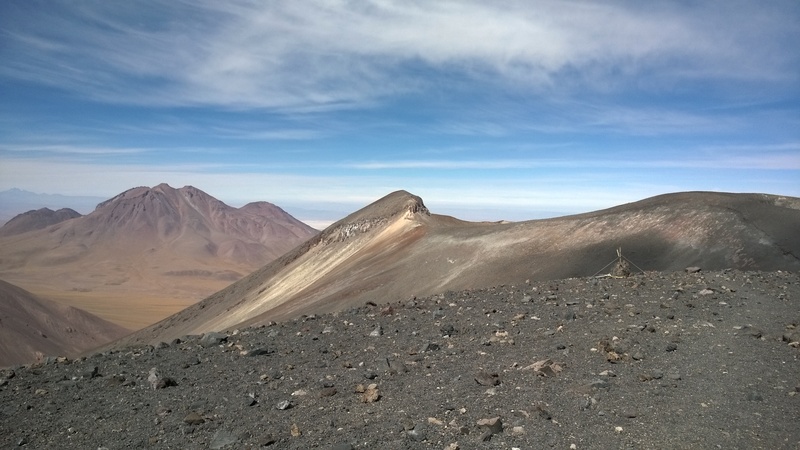 Its not the famously conical shaped one that everyone takes pictures of, that one is Licancabur. * Lascar is the flat topped volcano streaked with white. The white streaks aren’t snow (most of the time…occasionally it snows too) but are sulfur deposits. Also, on most mornings you can see a small cloud over Lascar, due to the fact that Lascar is an active volcano. 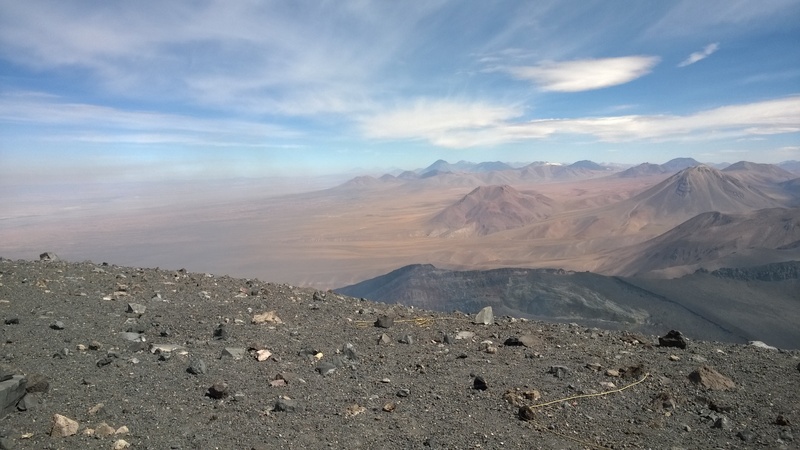 Not only is Lascar active, it is the most active volcano in Northern Chile. Its volcanism is the cause of one of the strangest climbing difficulties I’ve ever heard of: toxic clouds of sulfur. If the wind is coming from across the crater the hike can get very unpleasant. It is sometimes so bad that the hike can’t be accomplished. 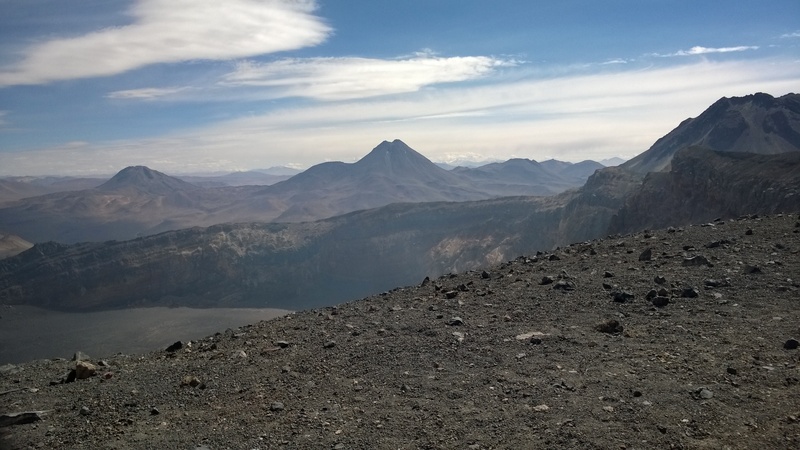 The hike up Lascar is very short, probably 2 miles/3.2km to the crater, and maybe another half mile/0.8km to the summit. Its probably for the best that the hike is so short – reaching the summit took us 2 and a half hours. Under all but the worst conditions we walk at 3mph/4.8kph. When the terrain gets really hilly, or if we’re bushwacking we can usually still manage 2mph. This time we averaged 1 mile per hour. I would have loved to have worn one of those pedometers that track your steps and calculate distances on this hike. The volcanic scree is very slippery, so each step forward includes a half step back. I would guess that your legs will tell you that you’ve climbed at least 50% more than you end up climbing. And then there is the altitude. The climb to the crater only adds about 1900 feet/580m, but the starting altitude is probably a hair under 16,000 feet/4,875m. What this means is that every breath you take contains 57% of the oxygen that it contains at sea level. And that is just at the bottom. At the summit you’ve lost 6% of that available oxygen. 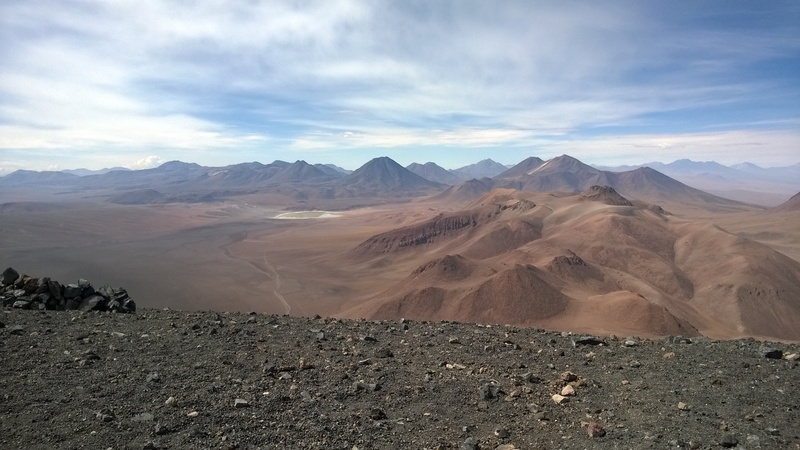 Altitude is the real difficulty of this hike, and acclimatizing is a must. We had hiked progressively higher for the previous 5 days, and the night before we abstained from alcohol and made sure to keep extra hydrated. Dehydration and altitude sickness are bedfellows – so if you know you’re going high keep drinking water. 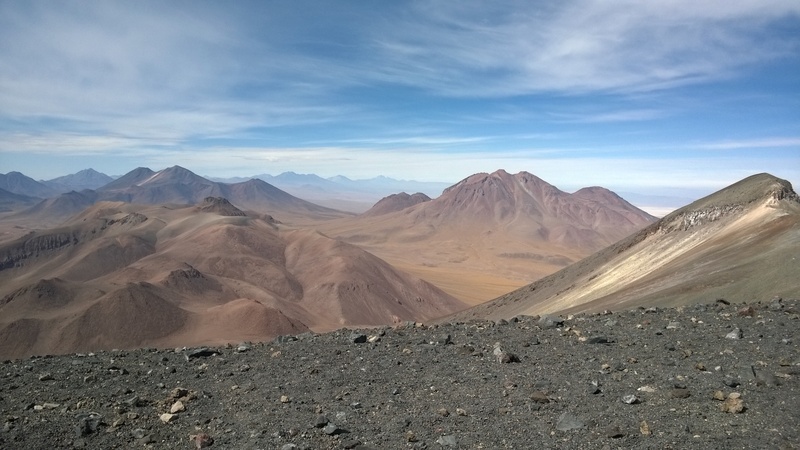 The hike starts early in the morning – Lascar gets windy in the afternoon and between the sulfur and the flying sand that can make the summit unconquerable. We had a pre-hike breakfast at this lagoon. For those of you driving yourself – get something with four wheel drive. It was a lot of fun watching the group behind us in a rental pickup truck struggle to get to the trailhead…but I doubt they were enjoying the process as much as we were. 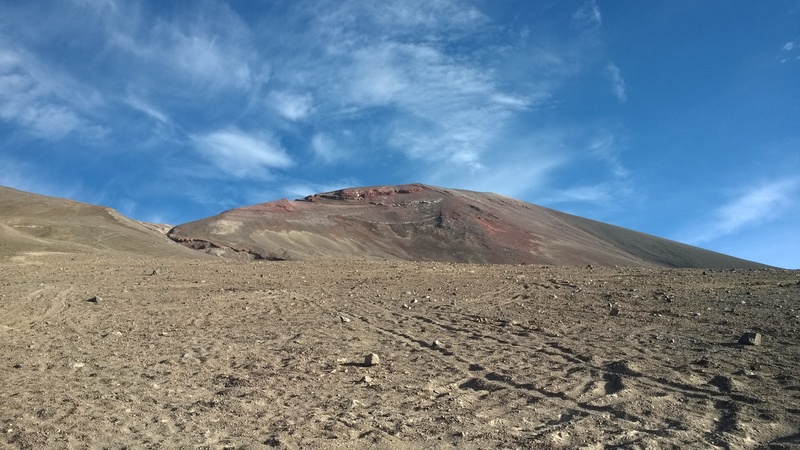 Our climb to the crater took us almost exactly 2 hours – but know that the same hike can take 3 or more hours depending on your conditioning and how the volcano is treating you. The trail is easy to follow, just remember that when the trail splits, take the bit that switchbacks. The straighter path is for when you’re coming back down. Once we reached the crater we ate bananas. They were squished and badly bruised from our backpacks – but all the same they were the tastiest banana we’d ever eaten. I’m not entirely certain it is just that we were starving and delirious from the altitude…I think it may have been a different variety of banana than we get in the states. In any case – best banana ever. If you climb Lascar, bring a banana, you’ll thank me later. The crater was the goal of the hike, but since we had made it in good time and good spirits we set off for the top. 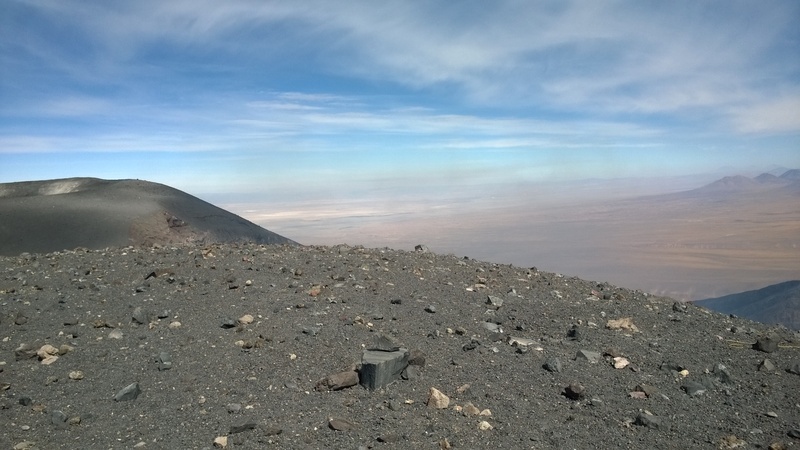 The climb to the top, being above the crater, is exposed to sulfur clouds. We only experienced a little bit of it as it was early in the day. 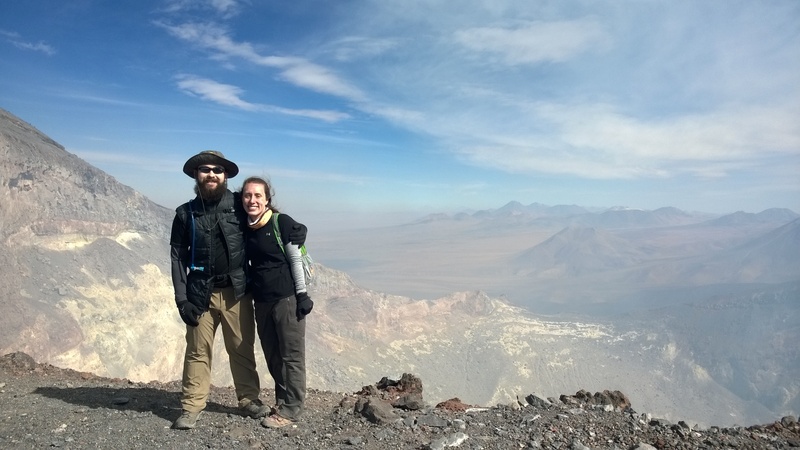 Our guide told us that the sulfur could get so bad as to end hikes – and due to that we were his fastest group to the summit. 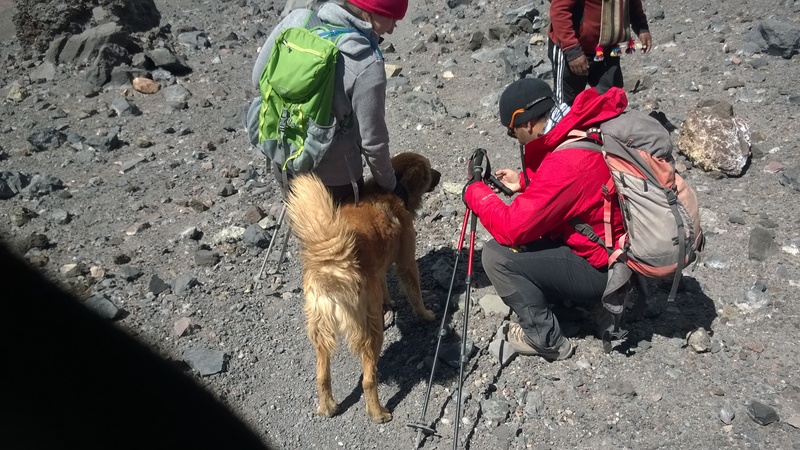 On a previous hike he had a faster charge (20 minutes quicker to the crater than us), but couldn’t reach the summit due to sulfur. Yay technicalities! The views from the top are staggering. The pictures fail to capture the sheer majesty of the sensation, it was truly awesome. See the 3 dots next to the squiggly line in the bottom right of this picture? That’s where the hike began – and those are the trucks we took to get here. On the way down we passed another climber, this one had the advantage of an extra set of legs. Based on how he kept running up the mountain, turning around and returning to his person, and then running back up – the extra set of legs seems to really have helped. The descent is much easier than the ascent – you basically run/ski down the volcano using your poles to stay upright. It takes a bit of practice and both Wren and I had some minor wipeouts. What had taken us 2 and a half hours to climb took us less than 45 minutes to descend. By the time I made it to the bottom I had over a cup of volcanic dust and pebbles in each shoe. Once we sat down in the car the altitude, dehydration, hunger and fatigue all hit like a ton of bricks. We had each brought 2 liters of water and both of us had finished all of it during the climb. It took a couple hours to return to an approximation of normalcy. 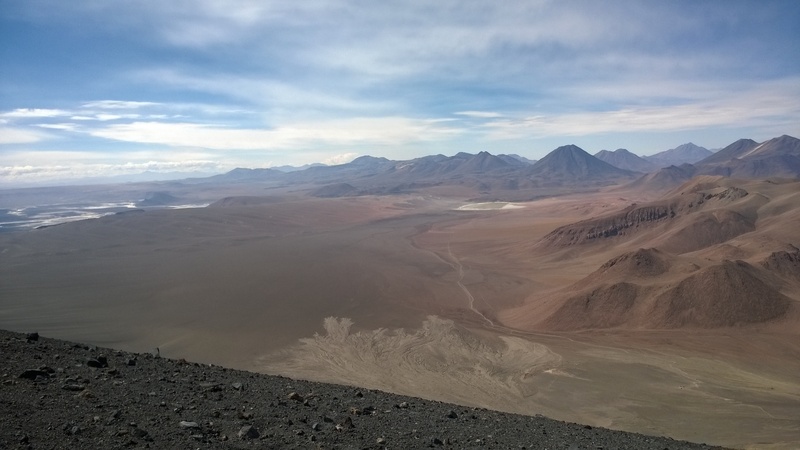 Something to note about this hike – the drive to the trailhead from San Pedro de Atacama is about 2 and half hours. If you’re driving yourself bring some coffee or something for after the hike – I could not have driven myself. *Lincancabur is a very picturesque volcano viewed from San Pedro – but its not one that people climb very often. The reason is fairly simple – land mines. 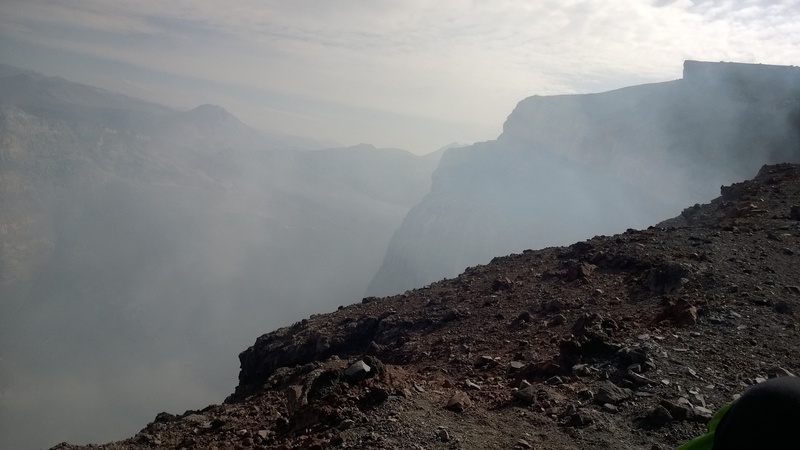 The volcano was mined and the mines have….well…shifted due to rains and mud slides. 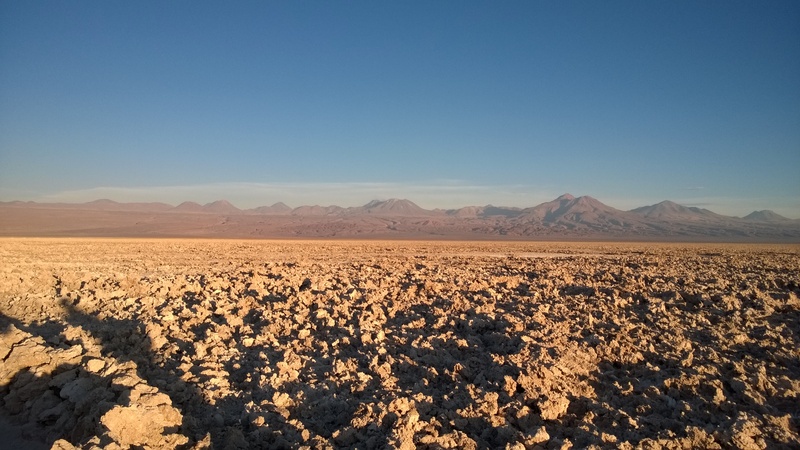 It is climbable from Bolivia – as the mines are on the Chilean side.